Most services are implementing or are heavily inspired by ESRI GeoServices REST Specification or by the Open Geospatial Consortium (OGC). This service provides metadata for all the available layers in the GeoAdmin API. searchText (optional) The text to search for in the layer description. lang (optional) The language. Supported values: de, fr, it , rm, en. Defaults to “de”. sr (optional) The spatial reference. Supported values: 21781 (LV03), 2056 (LV95). Defaults to “21781”. callback (optional) The name of the callback function. Here is an example of response. Here is a description of the data one can find in the above response. tileInfo: WMTS general information in json format. Note that this section is always identical and is not tied to a particular “map” like in ESRI specifications. This service is used to expose the attributes names that are specific to a layer. This service is especially useful when combined wit h the find service. With a layer ID (or technical name), this service can be used to retrieve a legend. No css styling is provided per default so that you can use your own. This service can be used to discover features at a specific location. Here is a complete list of layers for which this service is available. No more than 50 features can be retrieved per request. geometryType (required) The type of geometry to identify on. Supported values are: esriGeometryPoint or esriGeometryPolyline or esriGeometryPolygon or esriGeometryEnvelope. layers (optional) The layers to perform the identify operation on. Per default query all the layers in the GeoAdmin API. Notation: all:”comma separated list of technical layer names”. mapExtent (required) The extent of the map. (minx, miny, maxx, maxy). imageDisplay (required) The screen image display parameters (width, height, and dpi) of the map. The mapExtent and the imageDisplay parameters are used by the server to calculate the the distance on the map to search based on the tolerance in screen pixels. tolerance (required) The tolerance in pixels around the specified geometry. This parameter is used to create a buffer around the geometry. Therefore, a tolerance of 0 deactivates the buffer creation. returnGeometry (optional) This parameter defines whether the geometry is returned or not. Default to “true”. geometryFormat (optional) Returned geometry format. 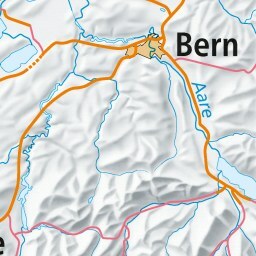 Default to ESRI geometry format. Supported values are: “esrijson” or “geojson”. The service identify can be used for Reverse Geocoding operations. Here is a list of all the available layers. mapExtent=0,0,100,100&imageDisplay=100,100,100&tolerance=5&geometryType=esriGeometryPoint&geometry=548945,147956 to perform an identify request with a search radius of 5 meters around a given point. This service is used to search the attributes of features. Each result include a feature ID, a layer ID, a layer name, a geometry (optionally) and attributes in the form of name-value pair. Here is a complete list of layers for which this service is available. One layer, one search text and one attribute. layer (required) A layer ID (only one layer at a time can be specified). searchText (required) The text to search for (one can use numerical values as well). searchField (required) The name of the field to search (only one search field can be searched at a time). contains (optional) If false, the operation searches for an exact match of the searchText string. An exact match is case sensitive. Otherwise, it searches for a value that contains the searchText string provided. This search is not case sensitive. The default is true. With an ID (or several in a comma separated list) and a layer ID (technical name), this service can be used to retrieve a feature resource. Here is a complete list of layers for which this service is available. With an ID and a layer ID (technical name), this service can be used to retrieve an html popup. An html popup is an html formatted representation of the textual information about the feature. Here is a complete list of layers for which this service is available. time (optional) Time (YYYY) to filter out time enabled layers, e.g. LUBIS. Defaults to “none”. The search service can be used to search for locations, layers or features. The layer search wich enables the search of layers belonging to the GeoAdmin API. Only RESTFul interface is available. searchText (required/optional) Must be provided if the bbox is not. The text to search for. Maximum of 10 words. type (required) The type of performed search. Specify locations to perform a location search. bbox (required/optional) Must be provided if the searchText is not. A comma separated list of 4 coordinates representing the bounding box on which features should be filtered (SRID: 21781). sortbbox (optional) When bbox is specified and this parameter is “true”, then the ranking of the results is performed according to the distance between the locations and the center of the bounding box. Default to “true”. origins (optional) A comma separated list of origins. Possible origins are: zipcode,gg25,district,kantone,gazetteer,address,parcel A description of the origins can be found hereunder. Per default all origins are used. searchText (required) The text to search for. Maximum of 10 words allowed. type (required) The type of performed search. Specify layers to perform a layer search. lang (optional) The language metadata. Supported values: de (default), fr, it, rm, en. searchText (required) The text to search for (in features detail field). Maximum of 10 words allowed. type (required) The type of performed search. Specify featuresearch to perform a feature search. bbox (optional) A comma separated list of 4 coordinates representing the bounding box according to which features should be ordered (SRID: 21781). features (required) A comma separated list of technical layer names. The results are presented as a list of object literals. Here is an example of response for location search. id: This is an internal value and therefore shouldn’t be used. weight: The weight is dynamically computed according to the searchText that is provided. It informs the user about how close an entry is to the provided searchText . attrs: The attributes associated to a given entry. origin: This attribute refers to the type of data an entry stands for. featureId: If available the object’s Id can be combined with the layerBodId to collect more information about a feature. rank: A different rank is associated to each origin. Results are always ordered in ascending ranks. geom_st_box2d: This attribute is in is in CH1903 / LV03 (EPSG:21781) reference system and represents the bounding box of the associated geometry. num: This attribute is only valid for locations with address origin . It refers to the street number. x and y: These attributes represent the coordinates of an entry. If an object’s entry is a line or a polygon, those coordinates will always be on the underlying geometry. label: The html label for an entry. Prefix filtering cannot be combined with parameter origins . This service allows to obtain elevation information for a point. See Height models for more details about data used by this service. elevation_model (optional) The elevation model. Three elevation models are available DTM25, DTM2 (swissALTI3D) and COMB (a combination of DTM25 and DTM2). Default to “DTM25”. sr(optional) The reference system to use (EPSG code). Valid values are 2056 (for LV95) and 21781 (for )LV03). If not given, trying to guess which one to use. This service allows to obtain elevation information for a polyline in CSV format. See Height models for more details about data used by this service. geom (required) A GeoJSON representation of a polyline (type = LineString). The LineString should not have more than 6‘000 coordinates. sr (optional) The reference system to use (EPSG code). Valid value are 2056 (for LV95) and 21781 (for LV03). Strongly advised to set one, but if not given, trying to guess which one to use. elevation_models (optional) A comma separated list of elevation models. Three elevation models are available DTM25, DTM2 (swissALTI3D) and COMB (a combination of DTM25 and DTM2). Default to “DTM25”. nb_points (optional) The number of points used for the polyline segmentation. Default “200”. offset (optional) The offset value (INTEGER) in order to use the exponential moving algorithm . For a given value the offset value specify the number of values before and after used to calculate the average. callback (optional) Only available for profile.json. The name of the callback function. In order to have access to the WMTS, you require to register to swisstopo web access - Inscription form (in German), even if most layers are free to use. See Which layers are available ? for a list of all available layers. Only the RESTFul request encoding to GetTile is implemented, not the GetLegend and GetFeatureInfo . No KVP and SOAP request encoding is supported. The GetCapabilites document provides informations about the service, along with layer description, both in german and french. Layername ch.bfs.arealstatistik-1997 See the WMTS GetCapabilities document. StyleName default Only default is supported. Time 2010, 2010-01 Date of tile generation in (ISO-8601) or logical value like current. A list of available values is provided in the GetCapabilities document under the <Dimension> tag. We recommend to use the value under the <Default> tag. Note that these values might change frequently - check for updates regularly. With the <tileOrigin> in the top left corner of the bounding box. The projection for the tiles is LV95 (EPSG:2056). Other projection are supported, see further down. The zoom level 24 (resolution 1.5m) has been generated, but is not currently used in the API. The zoom levels 27 and 28 (resolution 0.25m and 0.1m) are only available for a few layers, e.g. swissimage or cadastral web map. For the others layers it is only a client zoom (tiles are stretched). You have to use the <ResourceURL> to construct the GetTile request. Axis order: for historical reasons, EPSG:21781 WMTS tiles use the non-standard row/col order, while all other projections use the usual col/row order. However, most desktop GIS allow you to either use the advertized order or to override it. The tiles of a given layer might be updated withtout resulting in a new <Time> dimension in the GetCapabilities dimension. In case your application is caching tiles locally, you need to invalidate your local cache for this layer. To check the latest change of any layer, use the Cache Update service. Four projections are supported. The same tiles are offered in four other tilematrixsets/projection. Partly due to a limitation of the WTMS 1.0.0 recommendations, each projection has its own GetCapabilities document. The same access restrictions apply as above. The same timestamps are available in all projection. New timestamp are added to the former ones. The layer ch.kantone.cadastralwebmap-farbe uses a WMS service as its source. Note that all layers are available at all scales. You have to check for which tileMatrixSets a particuliar layer is defined. Your WMTS client may either stretch the tiles from the last available level or display nothing. Switzerland is now adopting the new LV95 frame. All available layers as WMTS. As noted in the WMTS service, the Tiles of a given <Time> dimension might be updated for technical reasons. If you are caching Tiles locally, this might result in your cache being outdated. Use the Cache Update service to query the Date of the last update for a given layer. If your cache is older than the returned Date, you have to clear your local cache. A RESTFul implementation of “Cesium” Quantized Mesh terrain service. Terrain tiles are served according to the Tile Map Service (TMS) layout and global-geodetic profile. In order to access the terrain tiles, you require to fill a swisstopo web access - Inscription form (in German). The layer.json file determines which terrain tiles are available. Time 2015311201 Date of tile generation in (ISO-8601). With the <tileOrigin> in the bottom left corner of the bounding box. The service provides both tiles and styles that the customer can use. A RESTFul implementation of “Cesium” 3D Tiles specification. In order to access the 3D tiles, you require a swisstopo web access - Inscription form . The tileset.json file describes the available set of tiles. In order to use this service, you must currently use a fork of CesiumJS, the 3d-tiles branch. Stay informed and have a look at the current RoadMap for 3D Tiles. Currently, 3 technical layers (ch.swisstopo.swisstlm3d.3d, ch.swisstopo.swissnames3d.3d, ch.swisstopo.vegetation.3d) are available and they contains all available 3D objects. Additional layers will be available in the future. Partial 3D buildings model coverage can be vizsualised here. This service enables the connection of geodata from different sources as Linked Data. It uses the open query language SPARQL. This service enables the download of datasets conforming to the INSPIRE Data Specifications. It is implemented as an Atom Feed / Open Search service according to the Technical Guidance for the implementation of INSPIRE Download Services.